It's Donna here, celebrating the fact that the sun has made it all the way to Victoria, and I finally have some sunny days to enjoy! 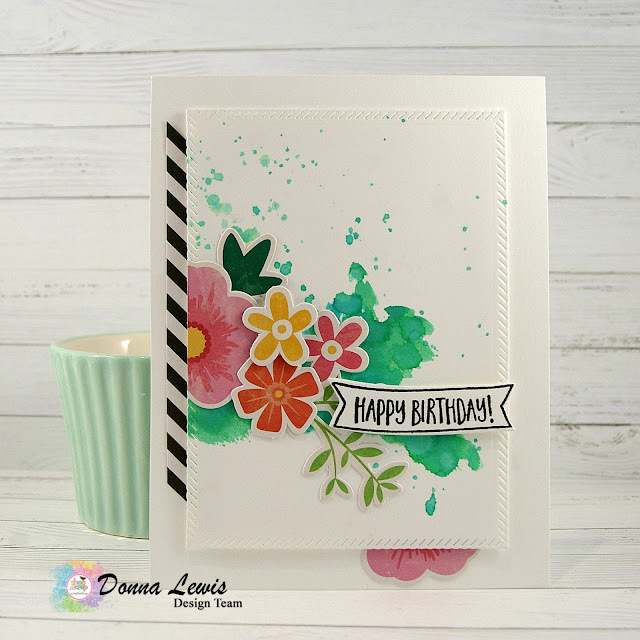 I've made two spring inspired cards to celebrate. I've used the lovely papers in the September Cropaholic Kit from Jillibean Soup. This first card has a splash of Distress Oxide which I loosely painted onto white cardstock, then spattered on some more for good measure! Onto this I adhered some flowers and leaves from the cutout sheet, cutting one of the bigger flowers in half ( I used the other half at the bottom of the page as a small tag) I used a sentiment from my stash, and some black and white striped paper from an earlier kit. The second card has a mix of elements, all from different parts of the kit. The yellow hearts are the leftovers from an earlier shaker card that I made using the kit. The sentiment was cut from one of the papers, and highlighted with a black pen. I used a doily, which I coloured with Distress Ink. I adhered the hearts so they appear to be floating off the page. I hope that these cards give you some ideas so that you can make the most of your kits. Until next time, may your days be sunny.